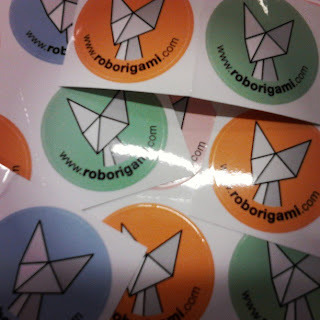 Roborigami, an installation I work on involving giant origami foxes and hidden robotic elements, was featured as part of Bristol Mini Maker Faire in the foyer of Birstol's most recent museum, the M shed. Maker Faires are a worldwide series of events associated with the 'maker movement', who are people who make things. This is championed by Make magazine, who prominantly featured Roborigami in a write up of the event. As the focus of the event was on making we decided that we would create the installation 'live', so attendees could watch the process of cutting, folding and adding electronics to the origami foxes. By the end of the day we had 10 foxes, as shown in this video. These new foxes are made of plastic, rather than card, making them water resistant. 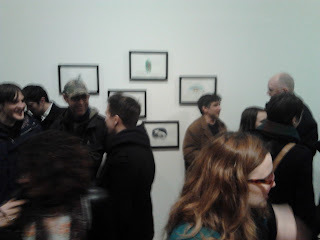 Here's a couple of photos from the event. 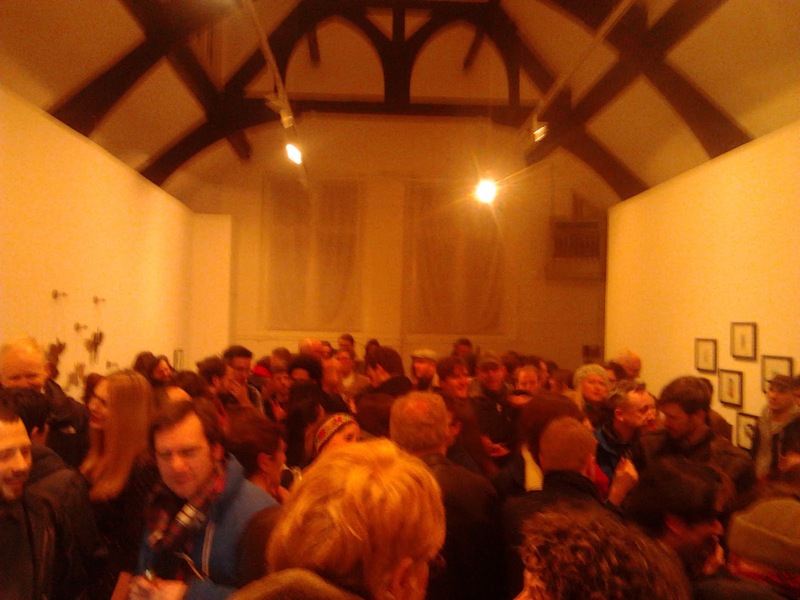 The turn out was incredible, you literally couldn't move for people. 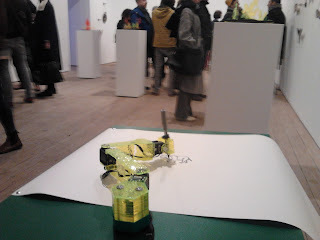 The robot was also well recieved and was drawing away all night. 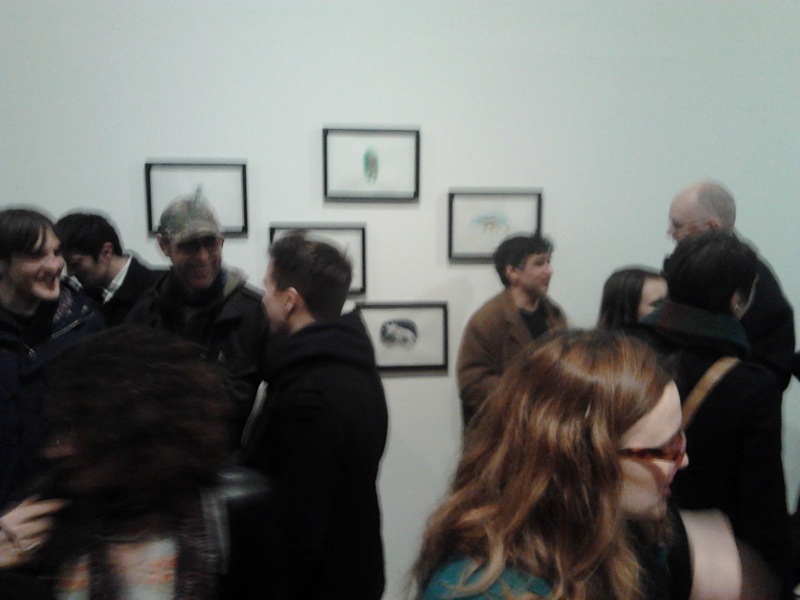 It will in fact be drawing continuously for the length of the exhibition, which runs from 22nd February to 23rd March. This will certainly be a test of the actuators (and my software). I discovered, after returning to Bristol from the opening event, that Wired have written a nice article on the robot. 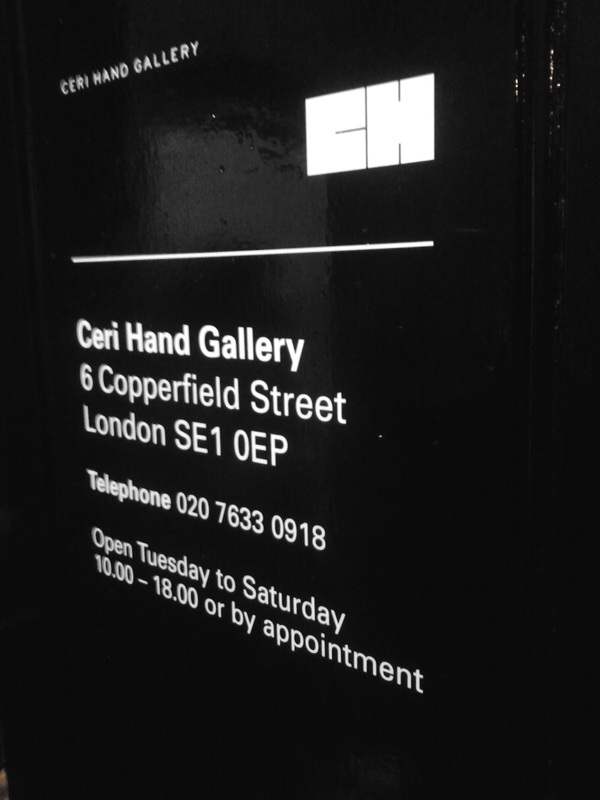 Here's are some details of the exhibition, which is in the newly opened Ceri Hand gallery, near the Tate Modern. Admission is free. The collaboration was generously supported by the Watershed, Bristol and was carried out as part of my residency at the wonderful Pervasive Media Studio. You can watch a video documentary detailing the collaboration on my website. 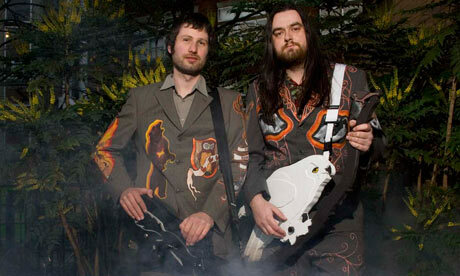 Tonight I'll be DJ-ing a Moombahton set at Warren at the Croft's Global Bass special in Stoke's Croft, Bristol. Here's a link to the facebook event. It's free entry and I'm on 11pm-12am, supporting the Moombahton DJ and producer, Boyfriend. To check out some of my Moombahton mixes please visit my mixcloud page. I've started trying to record a monthly DJ mix to put online. December was pretty hectic so this hasn't quite gone to plan so far. Regardless, here is my latest mix. This one goes across a spectrum of Moombahton, which is a relatively obscure brand of electronic dance music with lots of latin american / reggaeton influences. More info and tracklist can be found by following the link through to Mixcloud. As with much of my DJing, I've put quite a few bootlegs in here. The mix was made in one take on a couple of (somewhat flakey) second hand Numark Axis CDJs. You can download a mp3 of the mix at soundcloud. As part of my residency at the Pervasive Media Studio, I've begun a collaboration with Juneau Projects, the current artists in residence at the Watershed in Bristol. Juneau projects create very interesting paintings, sculptures, installations and performances related to nature and technology, as can be read in this article in The Guardian. They began their residency with an interest in using robotics and AI to create artwoks. Following a conversation, where I mentioned my work on the Dada robot with Justin Windle, they asked me to help create a drawing robot that, though it's own emergent behaviour, would create interpretations of images that they had created. 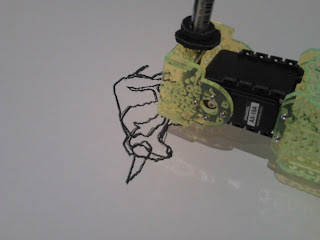 "Our robot arm's just done it's first drawing. We're very proud parents. Well done robot! 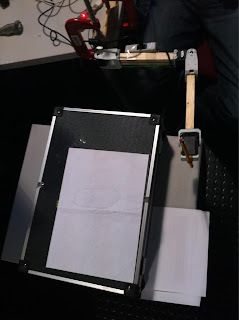 pic.twitter.com/oCL0iQSD"
Believe it or not, the robot was asked to draw a square. For reasons that are a bit too long to explain right now, the resulting blob can be regarded as a success. It's been pretty quiet around the Ad Lab recently, and generally that means that either I've been very lazy or very busy. It's definately the latter. 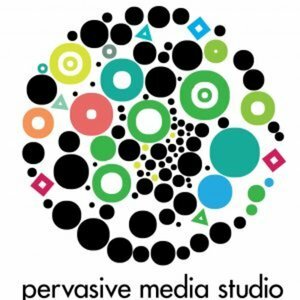 Since the last post, I was invited (in August 2012) to become a hot-desk resident of the wonderful Pervasive Media Studio (PMS) in Bristol, which has allowed me to formalise my creative technology work while being surrounded by some very interesting people and projects. You can see my studio profile here. Since starting at the PMS I've begun an exciting collaboration with their resident artists, which I'll report on in another post. I've also given a public talk as part of their 'lunch time talk' series, detailing some of my work in medical haptics alongside the origami foxes, Dada and Milk Pixel. You can read the write up of the talk here. 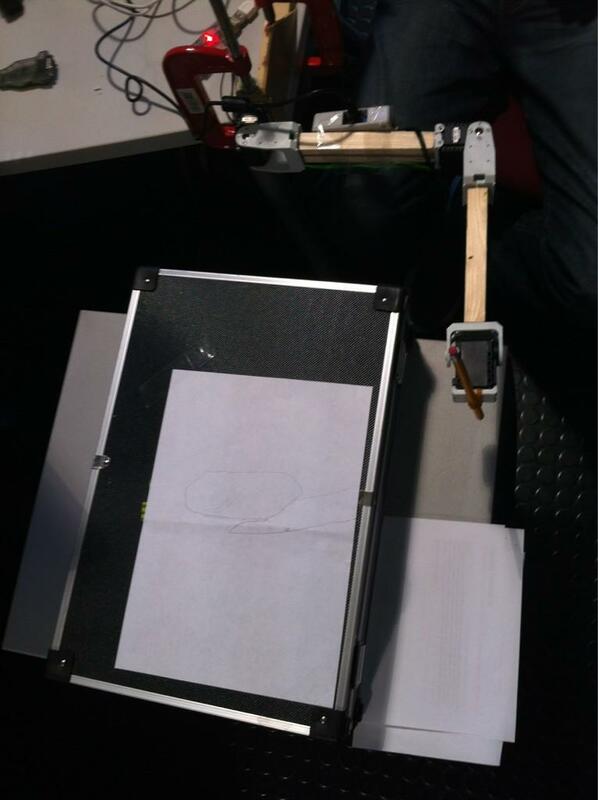 I am interested in Robotics, Haptics, Assistive Technology, Creative Technology, and hacking for the sake of it. I'm a full time robotics researcher and creative technologist on the side. When I'm not busy, I wonder what the hell has happened. I also like to DJ and have a cat with opposable thumbs.